We’ve had some luxurious new arrivals to our dining chair range; introducing the ‘Chamonix’, the ‘Verbier’ and the ‘Belfort’. 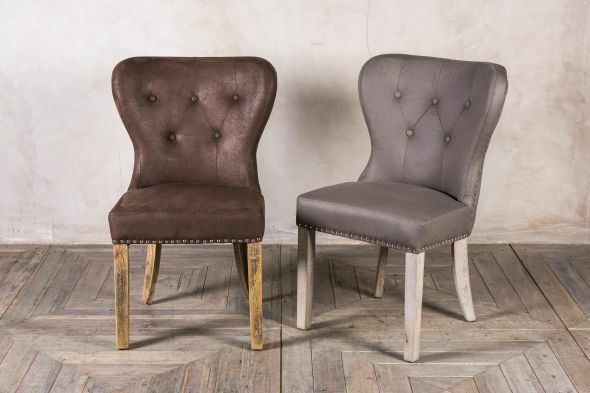 Whether you’re looking to refurbish a restaurant or revamp your dining room, these chairs from our new upholstered seating collection could add a touch of elegance to your home or business. 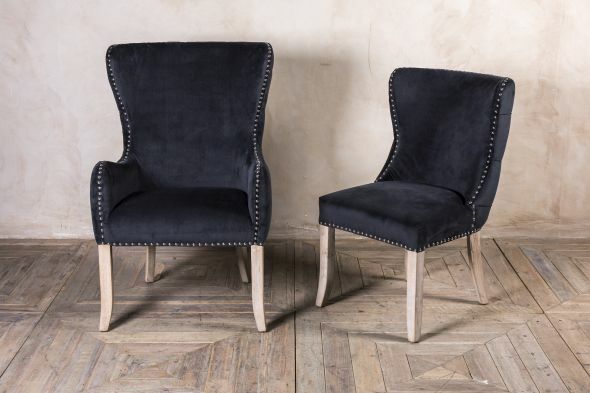 The ‘Chamonix’ comes in both a carver (£225.00 per chair) and side chair (£165.00 per chair), in almond, stone and smoky black velvet. When placed around a dining table, the chairs can’t help but make a statement. The outer chair backs are fully buttoned and studwork surrounds the edges. 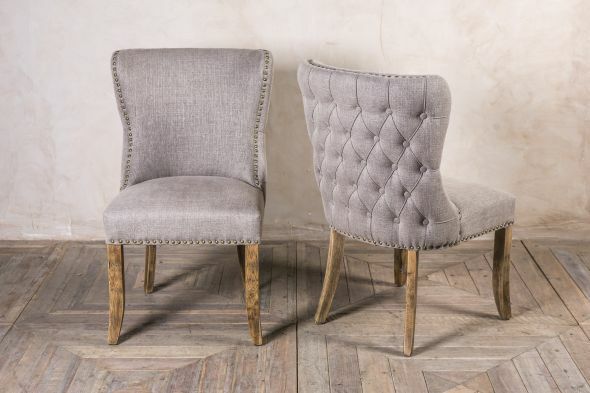 If you were going to mix and match, the stone and almond chairs would look perfect together. 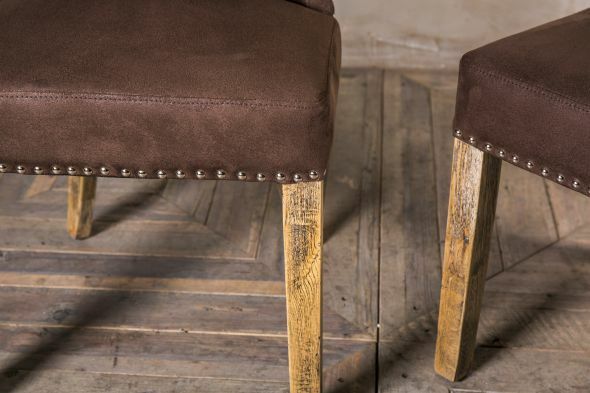 They have both been upholstered in high-quality, mixed linen, and have the same brass coloured studs and medium-oak wooden legs. 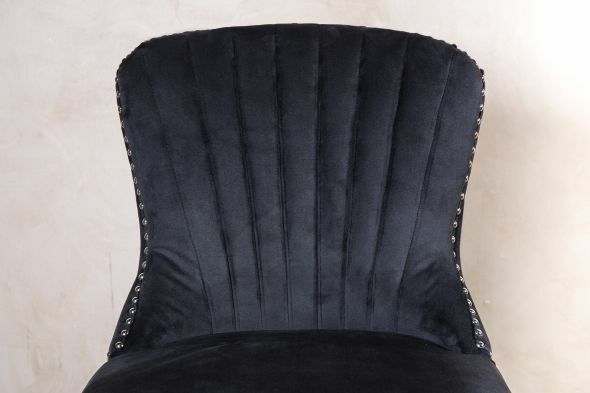 The smoky black velvet chair has limed oak legs and has been upholstered in sumptuous velvet. 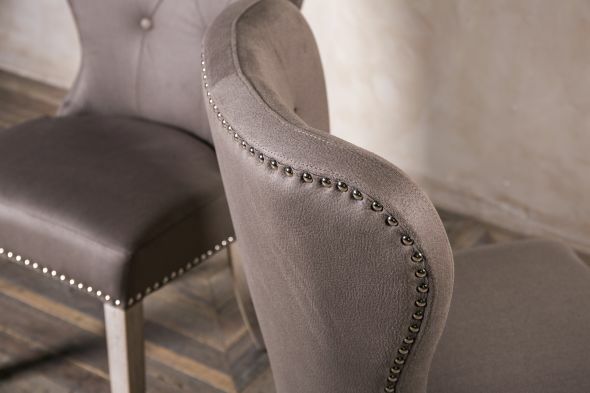 It has silver studs and looks great around our coordinating, limed elm table. 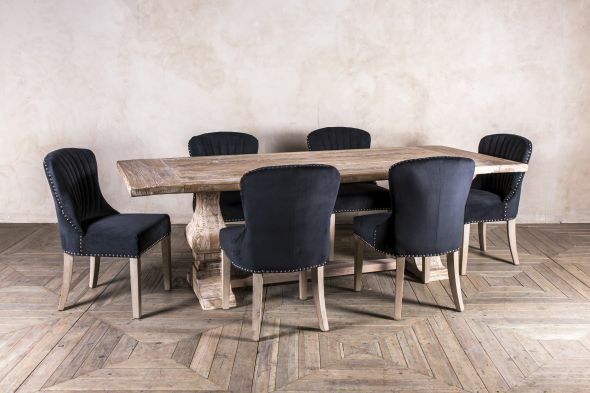 These chairs would make perfect dining room seating or statement chairs in a variety of interiors. 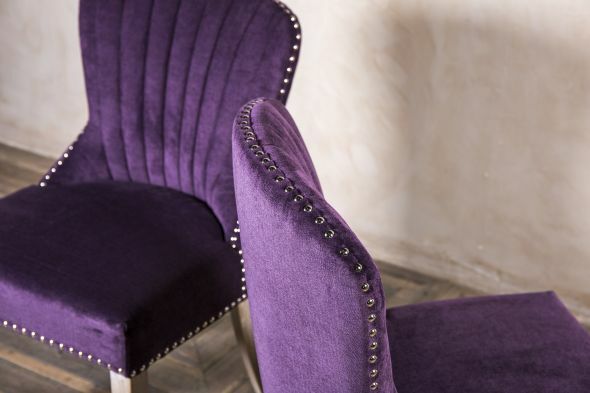 The ‘Verbier’ chair (£135.00 per chair) comes in the same smoky black velvet, along with purple chenille. 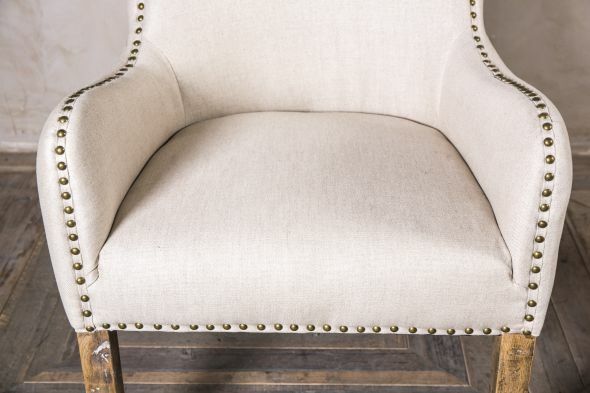 These upholstered dining chairs have a wonderful, shell-like detailing to the backs of their seats, and feature accentuating silver studwork and limed oak legs. Imagine these chairs in an contemporary restaurant or bistro around a large dining table, in your own home dining room, or even in a bedroom as a statement chair. 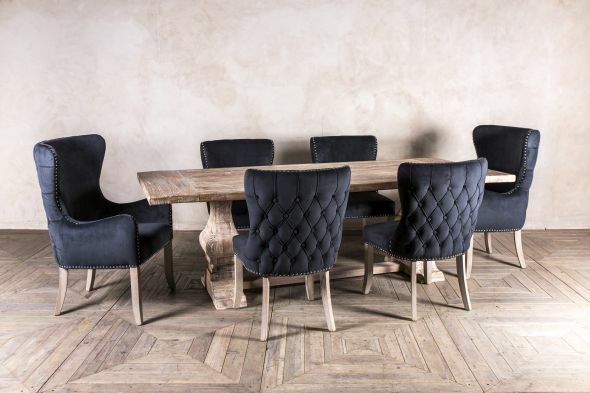 The ‘Belfort’ chairs (£130.00 per chair) combine practicality and style with their unique and comfortable shape. They feature wide-set, buttoned backs, and silver studwork to their outer edges. Limed oak has been used to make the cappuccino chair legs, whereas the chestnut chairs stand on medium-oak legs. 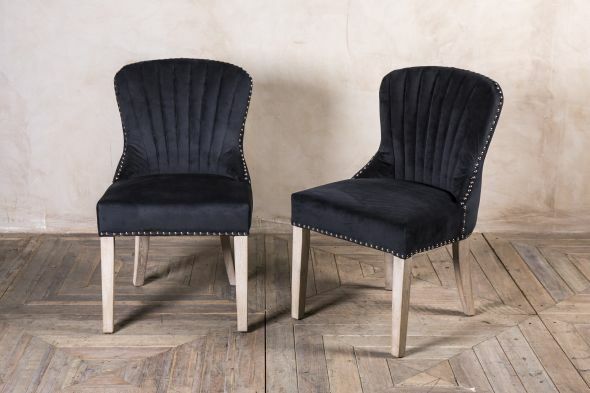 These suedette upholstered dining chairs would look lovely scattered around a boutique hotel reception, cafe or spa, as individual statement chairs. They would work equally well in modern restaurants and domestic properties as dining chairs. 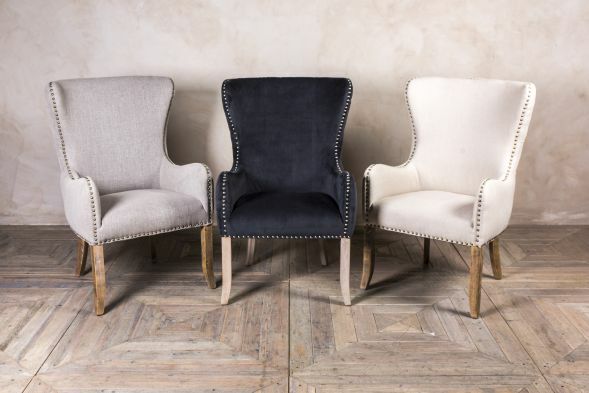 If you like the look of any of these chairs, please don’t hesitate to contact us to find out more: you can call us: 01543 375 872 or email us at sales@peppermillinteriors.com. 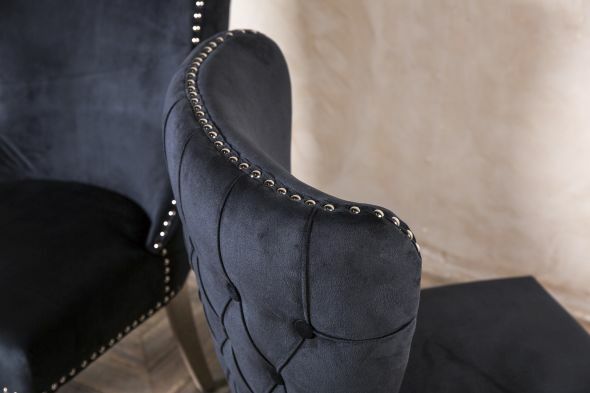 Better yet, come to see the whole upholstered seating collection for yourself in our Staffordshire showroom. For dimensions, delivery prices, and more information, follow the links at the bottom of this page.